The world’s largest trade fair of fruits and vegetables had called and exhibitors from 90 countries as well as thousands of visitors from around the globe flocked the large venues of the annual trade show held in Berlin last week. Although selling and trading issues dominated talks between producers, buyers and agents at the many stands, other topics presented by experts at meetings took on increased importance. This figure released by the Food and Agriculture Organization of the UN and highlighted at Berlin’s large Messe complex is thought-provoking and shocking. According to the FAO, more than 40 percent of fruits and vegetables spoils before being loaded on board an aircraft or vessel on the grounds of inadequate storage, technical shortcomings, outmoded means of surface transportation, poor infrastructure or lack of proficiency of local workers. This not only is experienced day after day in several African countries but is also a constant annoyance in India, Pakistan and some other regions where perishables are grown not only to be sold at local markets but mainly for exports. An intolerable waste of valuable food seen against the background of wide-spread poverty linked with hunger and malnutrition and the constant population growth on earth. So new ways of food production, handling, storage, and transportation are needed to put an end to this resource depletion. This was a core concern echoed by many experts attending the Berlin fair. The sad story is, however, that the philosopher’s stone for solving this pressing problem wasn’t found at Fruit Logistica. But this miracle nobody had really expected. More realistic were some sparkling projects tabled at the show, which, when realized on broad scale, could gradually improve agrarian production and supply in resource friendly manners. These fresh ideas came predominantly from smart start-ups that presented innovative concepts to the public aimed at minimizing waste and better the harvest-consumption ratio. One of these newcomers attracting attention was the Nigerian company ColdHub that offers new solar powered cooling cells. They enable small farmers to store their fruits and vegetables to adequate temp conditions. ColdHub claims that this way, post-harvest losses can be reduced by 80 percent. Which ultimately leads to higher crops and ups the producers’ earnings. Another start-up using solar energy is SunCity of Egypt. It sells solar powered pumps to farmers, enabling them to irrigate their fields without resorting to polluting and expensive diesels. Also a new trend became visible in Berlin: AI and robotic. Meanwhile, an increasing number of start-ups use robotics to simplify fruit and vegetable production. In the U.S., for example, more than seven million tons of apples were harvested in 2016 - by hand. This can be changed if using robots developed by the Israeli company FF Robotics. These machines are capable of harvesting 10,000 fruits per hour and put them gently on a conveyor belt thanks to their software based on artificial intelligence and their specially designed six gripper arms. 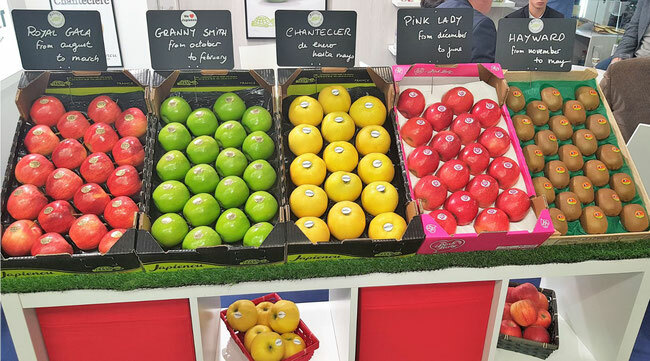 Another start-up attracting the attention at Fruit Logistica was a Dutch company named Pats. They developed mini drones that are able to independently identify insect pests in greenhouses and eliminate them. The outcome: less pesticides, less work, healthier fruits, higher yields. Soon to be harvested by robots? A different, but increasingly hot topic debated at the trade show was Brexit and its possible consequences for producers, the logistics industry and above all British consumers. This, because 84 percent of all fruits marketed in the UK are imported as are half of all vegetables. According to the 2019 issue of the European Statistics Handbook, the UK imports fresh fruits worth 4.5 billion euros p.a., while they export only fruits in the region of 300 million euros. Whatever the outcome of Brexit might be, it will have a huge impact on intra-European fresh food logistics, the cold storage industry and finally the consumers in Great Britain. In addition to topics tabled and discussed at conferences, the trade show was once again characterized by the many booths exhibitors from around the world had booked for meeting clients and visitors, presenting their products and capabilities. 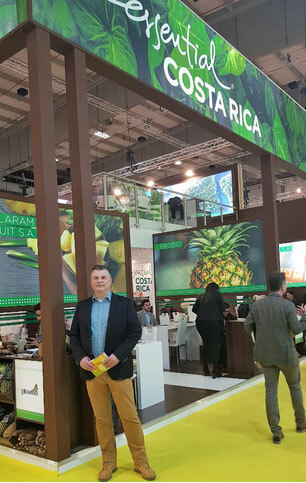 Of course, companies connecting producers and consumers were also present, running stands at Fruit Logistica. So were shipping lines Maersk, MSC, Hapag-Lloyd or Hamburg Sued, while Lufthansa Cargo, Cargolux or Egyptair Cargo flied their airline’s flags. Commented Chief Commercial Officer Dorothea von Boxberg of Lufthansa Cargo: “For us it is a must to be here because that’s where our customers are.” Their stand C-07 in hall 25 was crowded most of the time, but jammed like a sardine can at their daily happy hour, when fruits and cookies were served but also freshly tapped German beer. 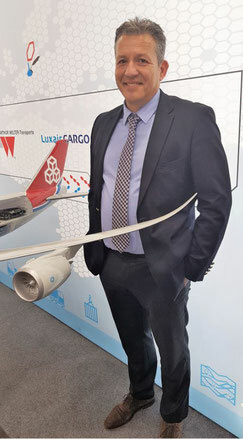 A similar situation experienced Cargolux at their stand in hall 21, run by Stavros Evangelakakis and his team. “Many visitors showing high interest in our product ‘CV Fresh’, a multitude of encouraging talks, Berlin was worth participating,” summarized the carrier’s Global Product Manager Healthcare & Perishables. He certainly was not the only one who returned home with this impression after the show had closed its doors after three intensive days. Import of fruit into London. Trading of different kinds of fruit and veg which has been created by Allah (god) little comes into the uk . Look at countries like Pakistan the fruit that they have which can be exported is un heard of in the U.K. .
From its early stages, where it was just a few stands during the 'Gruene Woche' food fair, FL has indeed reached an impressive scale and features companies and products from all walks of life in the perishable food industry. Well worth the visit.